Compact oil immersed hydraulic brake units are enabling renewable energy turbines to make the most of energy production from sub sea tidal flows. 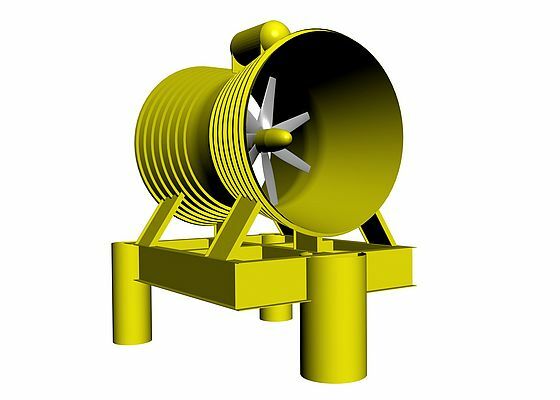 The Rotech Tidal Turbine (RTT) is a unique solution to the problem of providing renewable energy, one that is predictable, economical and has a minimal visual impact on the environment. The RTT unit is completely submerged and is connected to an on-shore electrical substation via sub sea cable. A 1MW prototype is reaching the final stages of construction that will produce enough electricity to power around 800 homes; the company is also in negotiation with several energy companies about large projects that are looking extremely positive, subject to environmental approval of the working prototype. An exclusive global license for sales and marketing of the RTT has been signed with Lunar Energy who are commercialising the technology. Lunar Energy has focused on potential site identification and assessment both around the UK coast and abroad for tidal power sea farms. Lunar is currently in discussions with EON and KOMIPO one of Korea’s main power generation companies. The RTT is a gravity based venturi with a central cassette containing the generator, hydraulic pump, brake and motors. The central cassette is removable for operational and maintenance purposes. The design is robust and invisible while in use on the sea bed, the venturi captures the tidal flow energy very efficiently so its performance is competitive with wind energy and considerably less controversial in visual terms. The impellers are mounted on a central shaft within the cassette that incorporates an in-line fixed displacement hydraulic pump and the Wichita brake, all within a sealed pod. In order to maximize the flow efficiency through the turbine the electricity generating motor is mounted outboard of the flow tube. The hydraulic pump drives the generator via two hydraulic swash motors in an efficient closed-loop system. The brake is crucial to the central cassette design, allowing the cassette to be manufactured, handled and installed safely while separate to the surrounding tube and seabed mounting. The brake provides a full-stop mechanism to prevent the central shaft and impellers from turning during build, installation and maintenance. Mounting inline with the shaft meant fitting within the maximum allowable diameter dictated by the hydraulic pump motor, a tight spot which required the brake to provide an extremely high braking force from a compact envelope. The brake also provides an emergency stop function, and has to be powerful enough to be able to stop the turbine in seconds when it is working at full-speed, and to do this repeatedly. The brake remains on when hydraulic power is not being supplied. It is a fully dynamic brake that provides protection for both the unit and those working around it. 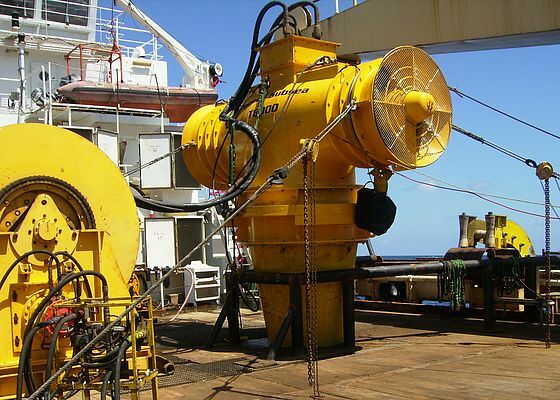 The company supplies a comprehensive range of clutches and brakes for the marine industry that have been tried and tested for anchor handling, cable-laying, mooring winches, hoists, cranes, dredge pumps and main propulsion drives. Their rugged construction is known to give dependable performance and extended service life in tough conditions and so they were the logical place to start looking for a product that could be totally submerged and operate under pressure depths of 100m. The product supplied was not an off-the-shelf product, although it was based on an existing Wichita technology; the result was the Oil Immersed HBS 42-12 Brake. The base unit is an oil-immersed brake which it is extremely compact when compared to its braking power, and so was an ideal solution for the RTT module as it could be mounted inline with the shaft but not restrict flow through the turbine, therefore maximizing on its generation efficiency. Cellulosic linings, combined with a large volume of cooling oil within the housing make the unit capable of dealing with approximately 13 Megajoules of stopping energy. The brake is capable of providing a braking torque in excess of a million Newton metres. An innovative sealing system was developed by Rotech specifically for this application to balance the oil pressure within the unit and work with the cassette design that incorporates just one dynamic seal on the whole shaft, including the bearing system. The 1MW prototype has been developed with the assistance of phased DTI funding; testing of the generator pod is in progress. The control system and hydraulics are assembled and tested and the generator synchronized with a simulated power grid. The next stage is a full dry test. The Rotech Tidal Turbine prototype will soon be working in one of the worlds’ most challenging power transmission environments: on the sea floor. Achieving the optimum pump/motor interface would be easy if shafts were perfectly aligned, machines didn't vibrate, and if the shafts never actually moved. In the real world we need flexible couplings.